Research sets the pace of a university. This is one reverberating mantra of higher education systems worldwide in the face of striving for better rankings and pressure to generate new knowledge that many races demand. This must be simply because to be truly helpful to society, those who make powerful decisions must be backed up by information validated by research. To articulate this, the University of San Jose-Recoletos concretizes its core function by investing and enabling its faculty engage in highly productive academic activities and more importantly also by capacitating students, before and after graduation, produce research outputs of world parity and have encompassing impact to its needs before and after graduation. Just recently, seventeen senior accountancy students submitted their feasibility studies personally to the university president, Rev. Fr. Cristopher C. Maspara, OAR. The students explored into degree offerings and extension programs in various levels. This may have significant contributions on the way USJ-R and its immediate communities shall be steered by leaders at a time that is marked by crossroads and changes in the higher and basic education landscape of the Philippines. 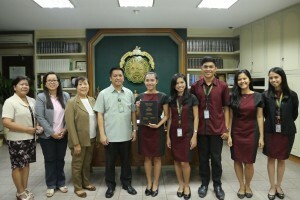 Another set of BS Accountancy students looked into the proposed extension school in an immediate Recoletos community composed of Gonna Mae J. Bacla-an, Shaira Marie A. Calinawan, Paul Denmark Cortado, Karen Kay A. Redilosa, and Rielvie Jane A. Solon. While Cheryl Bilagantol, Charles Ray Alfeche, Hannah Marie Simbajon, Shardel Capuno, Christian Dela Cruz, May Joyce Torcende also delved into A Proposed College Extension of the University of San Jose-Recoletos, Inc. at Balamban, Cebu . 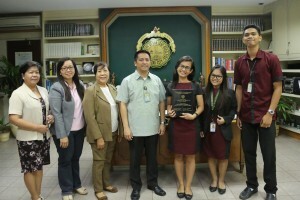 The last group composed of Samantha Gloria P. Galenzoga, Princess O. Gumanit, Honey Grace A. Lariba, Ian Renz Singculan, Allen Jay Tan, and Alyssa Jean H. Velasquez focused on a new course offering in one of the colleges of the university. Aside from the guidance of Dr. Victoria L. Digao, CPA, during the entire semester, many of the students were also assisted by Kristine June Uy, Finance and Accountancy Chair Rosemarie V. Jacalan and their panelists and professional accountants, Jun Brian B. Alenton and Cedric Val Naranjo. The Accountancy Department of the university has been declared Center of Development by the Commission on Higher Education (CHEd). It has also been home to a number of topnotchers. In fact, the current dean of the said college, Dr. Edgar R. Detoya, CPA was also a topnotcher in the CPA Licensure Examinations in late 1980’s. The College of Commerce has the most number of enrollees in the history of USJ-R.
Aside from the Center of Development in Industrial Engineering and Accountancy, USJ-R also has 2 Centers of Excellence for its College of Education and College of Information Technology. It has also linked up with various universities overseas for program exchanges and other similar arrangements in line with the internationalization of education in the country.